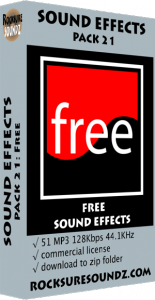 A pack of 51 free sound effects for download can be found at the rocksuresoundz website. The sfx can be used legally in commercial or non-commercial projects and are available in mp3 format only. They cover a range of generally useful sounds. Scroll down to the bottom of the homepage, and you will find this pack at http://rocksuresoundz.com.